Painting Acrylic on Canvas | 28" x 38"
Painting Acrylic on Canvas | 38" x 28"
While I stayed at the Cholamandal Artist village, Chennai, I had the opportunity to discover my style and my inspiration. Colors fascinate me the most and this is reflected in my paintings. My works are presented with linear configuration of abstract themes which unfold into matrix. I believe there so much more to learn and grow in life and art helps me to reach a higher level of being. My motto when it comes to art is simple- I search for me, within me and I look for me out of me. Raju Durshettiwar hails from Yavatmal, Maharashtra. He earned his BFA from Nagpur School or Arts. Raju has been a part of several solo and group shows in the country and in Japan. His work has been exhibited In Chennai, Coimbatore, Pondicherry and in galleries like the Jahangir Art Gallery, Mumbai. 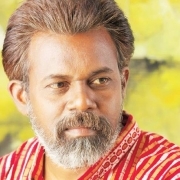 For his work, he has been awarded by the ministry of Culture, government of India. His work has an aura of architectural forms playing with light and shade.